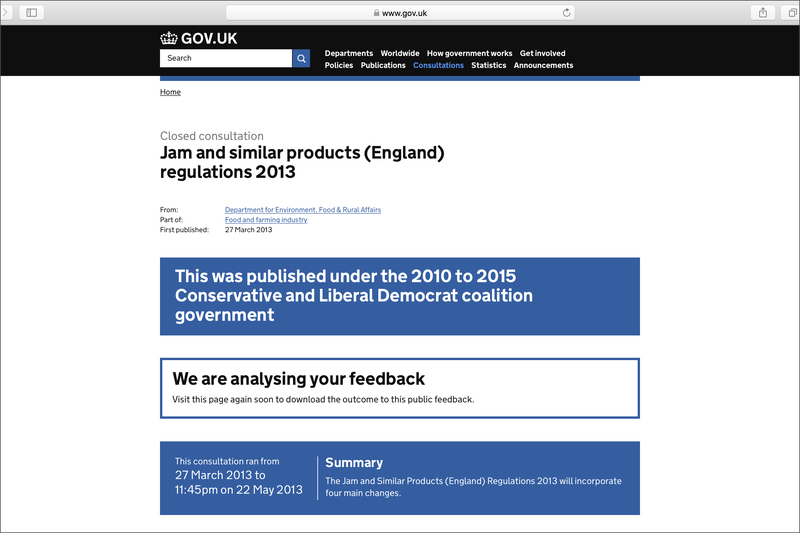 On 27 March 2013, the Department for Environment, Food and Rural Affairs of the British government (DEFRA) launched a public consultation1 of UK businesses and organisations ‘involved in the manufacture of jam and fruit spread products’. It proposed to amend the ‘Jam and Similar Products (England) Regulations 2003’ and reduce the minimum sugar content of jam from 60% to 50%. “We have our differences in the way we make foods. and it’s because of the sugar content; you’ll start to lose that”. dull colours that don’t taste the same, and certainly don’t last as long”. Europe, as other markets like the USA, was only asking for one principle to be respected: you wouldn’t sell abroad what you wouldn’t sell in your own country. British made ‘jam’ had to be considered as ‘jam’ within Britain to be accepted abroad. Only fair. The problem in reality lay within the UK. Restrictive British rules were preventing some British fruit preserves manufacturers from selling their products as ‘jam’. Those outdated rules were limiting their freedom to use the term ‘jam’ as a competitive advantage. The standards had not changed despite the fact that jam production processes and the quality of jam jars had long evolved, allowing for less sugar to be added as a preservative for the jam to be safe to eat. We were not in the 1920s anymore, when concerns about the food safety of canned foods were at their peak with deadly poisoning caused by botulism7, which probably influenced the Bristol scientists who formulated their guidelines for the British jam industry at the time. And with the general trend of adding less salt and sugar in our food nowadays, it is no surprise that tastes have changed and that many people as a result now prefer jams lower in sugar and higher in fruit. The results of the consultation haven’t been published. Screenshot 31 March 2017, http://www.gov.uk. Having said that, article 50 was triggered two days ago. The United Kingdom is on its way out of the European Union with the hope of becoming its ‘closest friend and neighbour’, as stated by the British Prime Minister in her 29 March letter to the President of the European Council8. With the fear of being absorbed into European federalism becoming past history, the country may now find it easier to solve those internal regulatory issues. Advancing jam regulations will appear as secondary to many, however I find it an interesting case to look at. Part 2 of this article will investigate the future of jam and similar products post-Brexit, in particular the opportunities for British and European citizens to enjoy traditional and more innovative fruit preserves on both sides of the Channel. This entry was posted in Stories and tagged UK by Les Jardins d'ici. Bookmark the permalink.